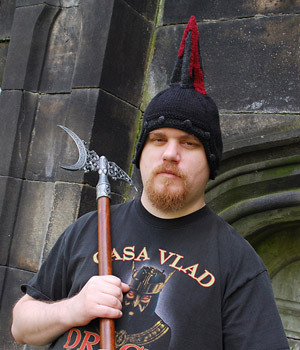 Vlad the Impaler didn't crotchet his own ear-flapped bobble hats. And neither should you. Continuing our foray into evolutionary haberdashery, this battle helmet features bobble rivets and a pre-bloodied spike. Fits a 22"/56cm to 23"/58.5cm head. Approx. 14"/35.5cm tall from nape to tip of spike. 20 sts and 30 rows per 4"/10cm with larger DPNs in stockinette stitch in the round. M1r (make one, right leaning): From the back, lift the bar between your last stitch and your next stitch, knit into the front of the lifted stitch. M1l (make one, left leaning): From the front, lift the bar between your last stitch and your next stitch, knit into the back of the lifted stitch. Mb (make bobble): Knit into the front, back, front, back, front of one stitch (makes 5 stitches); turn work, purl the 5 stitches; turn work, knit the 5 stitches; turn work, purl the 5 stitches; turn work, k2tog, k2tog, k1, pass two stitches made from the k2togs over the last stitch. With larger dpns and MC yarn, CO 8 stitches onto one DPN. Divide stitches evenly onto 4 of the needles (2 stitches per needle) and join to work in the round, being careful not to twist your work. Rnd 2 (and all even rounds until listed otherwise): Knit all stitches. Rnd 3: *K1, m1r, K2, m1l, k1* around. Rnd 5: *K1, m1r, K4, m1l, k1* around. Rnds 7 through 23 (odd rounds only): Continue to increase as in the prior rows, adding two knit stitches between the increases in each section until you have 104 stitches total. Starting with Rnd 24, knit 15 rounds even for 2"/5cm. Row 40: Place first 26 stitches on a holder or waste yarn, purl remaining stitches (for ease of working flat, these can be transferred to a cable needle if desired). Row 41: Ssk, k to last two stitches, k2tog. Row 42 and all even rows: Purl all stitches. Row 43: Knit all stitches. Row 45: Knit all stitches. Row 59: Ssk, k to last two stitches, k2tog. Row 61: Same as row 59. Row 63: Ssk two times, knit to last four stitches, *k2tog* twice. Next switch back to working in the round. Terminology will change from rows back to rounds. Rnd 66: Pick up and knit 13 stitches from the right side of the hat between your live stitches and those on the stitch holder. Transfer stitches from holder back to the needle, pick up one additional stitch between those just transferred and those picked up, k2tog (picked up stitch with one from the holder). Knit 24 stitches along the front of the hat, transfer last stitch from the holder to the right needle, pick up one stitch from the left side of the hat, transfer stitch back to left needle, SSK (stitch from holder and picked up stitch). Pick up and knit 13 stitches from left side. You should now have 112 stitches total on the needles. If you have not yet switched to a circular needle, you may find it necessary to do so at this point so you don't lose any stitches on your DPNs. 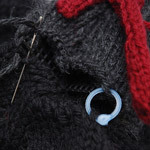 Knit 30 stitches, place a marker to mark the new start of the round, switch to your US4 circular needle. Rnd 67: Purl all sts. Rnd 68: K28, m1r, k2, m1l, k10, ssk, k2tog, k24, ssk, k2tog, k10, m1r, k2, m1l, k28. Rnd 69: Purl all sts. Rnd 70: Switch to CC1, repeat rnd 68. Rnd 71: K3, bobble, *k7, mb* 11 times, k4. Rnd 72: Repeat rnd 68. Rnd 73: Switch to MC, knit all sts. Rnd 74: Purl all sts. Rnd 75: Repeat rnd 68. Thread tail from top of hat onto needle, pull through the inside if not already and weave in end, closing up the hole if necessary. With smaller dpns and CC1 yarn, CO 72 stitches onto one dpn, leaving a long tail for future use. 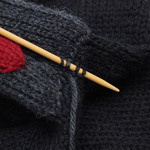 Divide stitches evenly onto four of the needles (18 stitches per needle) and join to work in the round, being careful not to twist. Rnds 1-5: *K1, p1, k6, p2, k6, p1, k1* around. Rnd 6: *K1, p1, k4, ssk, p2, k2tog, k4, p1, k1* around. Rnds 7-11: *K1, p1, k5, p2, k5, p1, k1* around. Rnd 12: *K1, p1, k3, ssk, p2, k2tog, k3, p1, k1* around. Rnds 13-17: *K1, p1, k4, p2, k4, p1, k1* around. Rnd 18: *K1, p1, k2, ssk, p2, k2tog, k2, p1, k1* around. Rnds 19-23: *K1, p1, k3, p2, k3, p1, K1* around. Rnd 24: *K1, p1, k1, ssk, p2, k2tog, k1, p1, k1* around. Rnds 25-29: *K1, p1, k2, p2, k2, p1, k1* around. Rnd 30: *K1, p1, ssk, p2, k2tog, p1, k1* around. Rnds 31-33: *K1, p1, k1, p2, k1, p1, k1* around. Rnd 34: *K1, p2tog, p2, p2togtbl, k1* around. Rnds 35 and 36: *K1, p4, K1* around. Rnd 37: *K1, p2tog, p2togtbl, k1* around. Rnds 38 and 39: *K1, p2, k1* around. Rnd 41: Knit all sts. Rnd 43: Knit all sts. 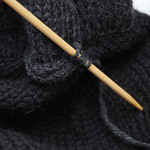 Break yarn, thread through remaining stitches and remove from needles, pull tight, turn to inside and weave in end. All Blood is worked in CC2. With two of the smaller dpns for working flat, CO 3 stitches, leaving a long tail for future use. Row 1 and all odd rows: Purl all sts. Row 2: K1, m1r, k1, m1l, k1. Row 4: K1, m1r, k3, m1l, k1. Rows 6, 8 and 10: Knit all sts. Row 12: Ssk, k3, k2tog. Row 14, 16, 18 and 20: Knit all sts. Row 24: Knit all sts. Row 26: K3, m1l, k1. DO NOT TURN, break yarn, leaving a 12"/30.5cm tail and set aside. With a new needle, CO 3 stitches in CC2, leaving a long tail for future use. Row 1 and all odd rows unless otherwise specified: Purl all sts. Row 2, 4 and 6: Knit all sts. Row 8: Knit all onto the needle with the reserved section on it (the reserved section will be on the right side). Row 9: Purl all stitches, including the 5 from the first section. Row 10: SSK, k4, k2tog. Row 11: Purl all sts. Rows 12 and 14: Knit all sts. Row 16: SSK, k2, k2tog Rows 18-30: Knit all sts. Row 31: Purl, break yarn, leaving a 12"/30.5cm tail and set aside. With a new needle, CO 3 stitches, leaving a long tail for future use. Rows 4 and 6: Knit all sts. Row 8: Ssk, k1, k2tog. Rows 10 through 18: Knit all sts. Row 20: K1, m1r, k1, m1l, k1. Row 4: K4, m1l, k1. Row 12: Ssk, k2, k2tog. Rows 14, 16 and 18: Knit all sts. Rows 22, 24 and 26: Knit all sts. Row 28: K1, m1r, k1, m1l, k1. DO NOT TURN, the rest will be knit in the round. Pick up first set aside needle, join with last knit needle and k1, m1r, k2, m1l, k1. Connect needles to work in the round. Rnd 2 and all even rounds: Knit all. Sew blood to spike with the yarn tails and needle, leaving the low-hanging portion unattached for the time being. It will overlap the trim on the hat and be sewn down as the final step. Cut your plastic canvas. You need 8 pieces that are 1.25"/3.2cm wide at the bottom edge, 5"/12.7cm high at the side edge, and 5.25"/13.3cm along the angled edge. 1. Put the long straight sides of two pieces together and sew. 2. Put the angled side of one piece next to an angled side of one of the already sewn pieces and sew. 3. Put a long straight side of another piece next to the straight side of the last sewn piece and sew. Continue steps 2 and 3 until all pieces are connected. Sew the first and last pieces together. Attach knitted spike to structure. 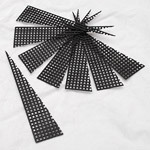 Place the knitted spike over the plastic canvas spike, with your inner purl creases (where you did the purl 2 between the knit sections) at the inner corners of the plastic canvas. Loosely attach it to the hat with stitch markers (the ones that open and close work great for this, though split ones should work as well), centering the outer corners between the hat's increase lines. With the long tail from the spike, sew the spike and the plastic canvas spike to the hat (this does not have to be entirely neat, since it will be hidden shortly). Weave in the tail and prepare for the next step. 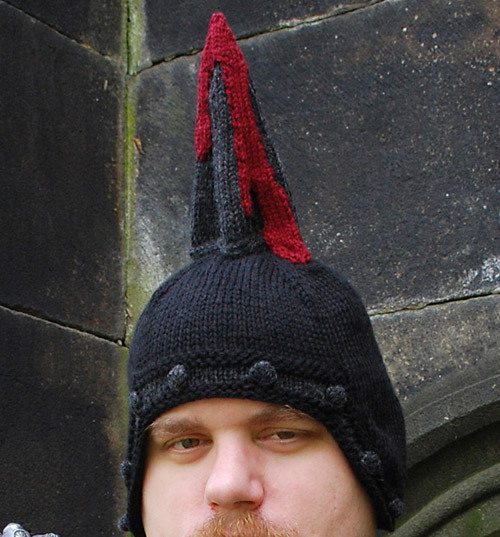 Connect knitted spike to hat. 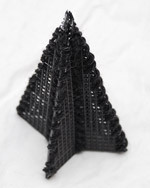 With CC1 and two of the US5 dpns, attach your yarn then pick up and knit 4 stitches from one of the inside corners of the spike - two from the spike and two from the hat. Attachment Row: Pick up one hat stitch, k2tog with the first live stitch, k1, slip the next stitch knit-wise, pick up and slip knit-wise one stitch from the spike, knit the two slipped stitches together through the back loop. Continue working Attachment Rows until you have gone all the way around the base of the spike. See below for special notes about turning corners. When you come to an outer corner, it will be necessary to add more rows to curve around the corner. 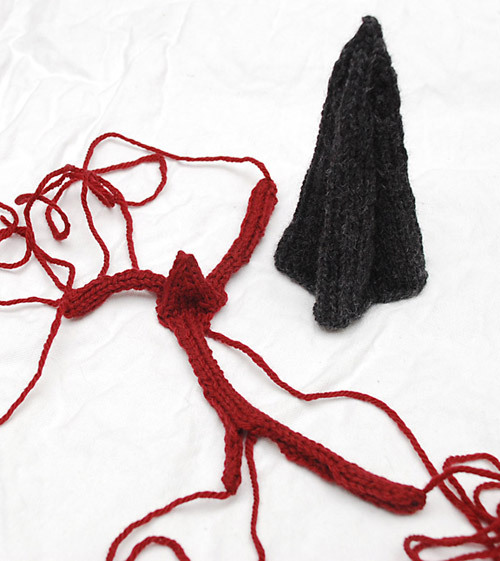 To do this, you will need to pick up the same stitches form the hat and the spike two or possibly three times. When coming to an inside corner, you will need less rows there, so don't pick up as many stitches. Once you have worked around the entire spike and are back to where you started, break your yarn and graft the live stitches on your needle to the stitches from the first Attachment Row (this may take some experimentation to get right). Sew down the remainder of the blood to the spike, trim and hat. Weave in ends. Block if desired to even out your stitches and spike, then go terrorize the neighbors with your shiny new hat.